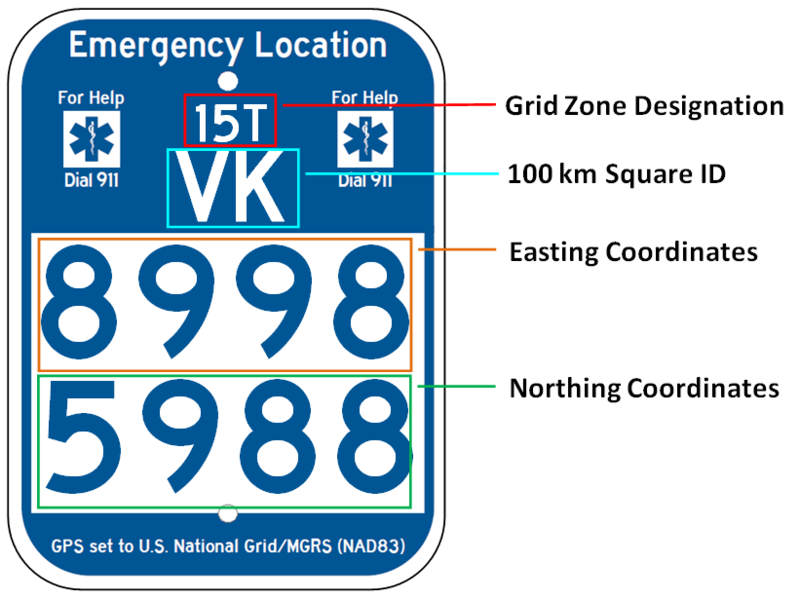 Emergency Location Markers (ELMs) are signs that provide coordinates for Emergency Responders, so the coordinates should be as accurate as possible. This page describes the general process to follow for ordering ELMs. If you have questions at any point in this process, please do not hesitate in contacting us for assistance. Understand the U. S. National Grid System. See the USNG Information Center Website for background information and training materials. Contact Emergency Responders and 911 operators in your area to discuss use of ELMs in your area of interest. Research the expected use pattern in your area of interest for ELM(s). Where are incidents likely to occur? Where are key locations such as trail intersections and trail shelters? Set your GPS readout to USNG (or MGRS), using NAD83 as datum. You may need to use GPS averaging (hold at one spot over a minute) to get a good quality location fix. If possible, save GPS locations as waypoints in the GPS, or record using other means. 12"x12" The 12"x12" size is designed to meet Minnesota Department of Natural Resources standards for outbuildings, warming houses and trailheads. 9"x12" The 9"x12" size is designed to Minnesota Department of Transportation specifications for motorized off-road vehicle trails, such as ATV trails, snowmobile trails and dirtbike trails. 6"x9" The 6"x9" sign size was specifically designed based on focus group research that indicated smaller signs minimize 'sign pollution' along trails for walking, bicycling, cross-country skiing and other recreational activities. Fill in the required fields for the USNG Coordinates on the order form (see graphic at right). Note that all 4 coordinates are required for "Fully Printed" ELMs, but only the first two coordinates are required for the "Partially Printed" ELM. Add to cart and purchase sign. Your sign will be made for you and shipped to you. We'll follow up with an email and PDF with a map of the sign location. Contact us about a multiple sign order to obtain a quote based on the number of signs you are ordering. Spreadsheet with Coordinates in defined columns. Use this USNG Sign Template. Note that 10-digit USNG coordinates should be truncated to 8 digits; Do not round the numbers up or down. Your signs will be made for you and shipped to you. Set your signposts and install the signs, using GPS to verify the correct location accurately. Contact Emergency Responders and 911 operators in your area to alert them to the installation of your signs and to make them aware of their locations.